Deploring recent media coverage about the American funding of the environmental movement in Canada, David Suzuki wrote an op-ed this week, published by Troy Media. He writes, "In a puzzling appeal to anti-American sentiment, some industry supporters claim that U.S. foundations are threatening Canadian policy by donating money to environmental groups here. These arguments have appeared in publications such as the Vancouver Sun and Calgary Herald, and on Sun TV." David Suzuki doesn't mention my name but the research in the media coverage to which he refers, is probably mine. Over the past few years, I have gone through the tax returns of American charitable foundations to try to figure out who is funding the green movement in Canada, and why. So far, I've traced about $300 million that American foundations have paid over the past decade to environmental groups in Canada. One of the things that I notice is that in some instances, environmental activism is funded by U.S. foundations as part of marketing campaigns in favor of American interests. The publicity and media coverage of scientific studies from environmental organizations appears to be a key tactic of these charity-funded, marketing campaigns. Indeed, as the David Suzuki Foundation has demonstrated over the years, nothing gets quick media attention quite like an alarming press release that begins, "New study shows..."
The problem is, some of the science that has been used in these charity-funded marketing campaigns is seriously flawed and in some instances, the findings have been falsely reported. David Suzuki's campaign about PCBs in farmed salmon is a prime example. Several years ago, David Suzuki personally sent a form letter to thousands of supporters, including me. He wrote to thank us, he said, for helping him "to uncover the fact that B.C. farmed salmon is heavily contaminated with PCBs and other toxins." Surprisingly, as I have explained in David Suzuki's Fish Story, published in The Financial Post, David Suzuki didn't uncover the "fact" that he said he did. In his study, mercury levels were actually higher in the wild salmon than in the farmed. The whole study only had eight fish. Depicting farmed salmon as unsafe and unsustainable helps to facilitate product differentiation and the positioning of Alaskan salmon as safe and sustainable. As the campaign against farmed salmon has swayed consumers back to wild salmon, the ex-vessel value of Alaskan salmon has quadrupled, from $125 million to $533 million. Having worked in salmon farming during 2002 and 2003, I am familiar with the fish farm fuss. 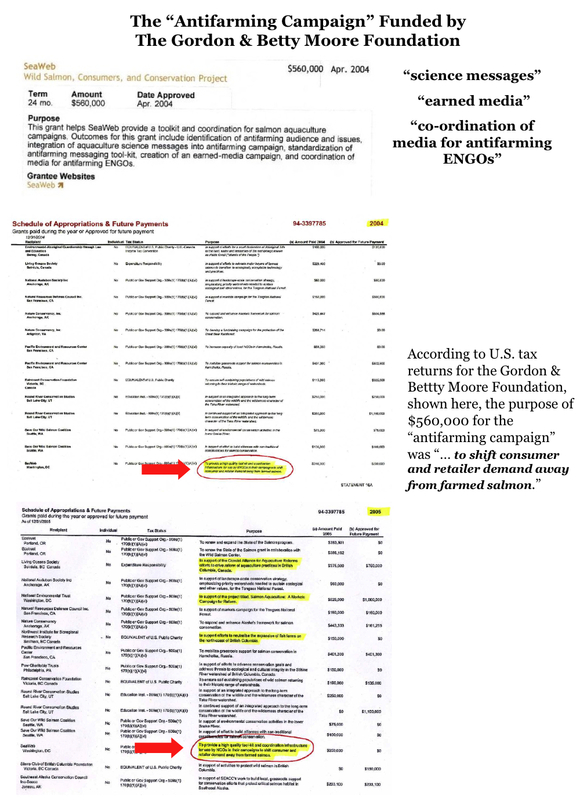 Several years after I lost my job in that industry, I unexpectedly came across a $560,000 grant for an "antifarming campaign" involving "science messages," "earned media" and "co-ordination of media for antifarming environmental organizations (ENGOs)." U.S. tax returns say that the purpose of this campaign was to shift consumer and retailer demand away from farmed salmon. What are the "science messages" of this marketing campaign? Who are the "antifarming ENGOs?" Seeking answers to these questions, I have written a series of letters to David Suzuki since the spring of 2007. The point of my letters to David Suzuki is to inquire as to whether his foundation may have exacerbated controversy over fish farming as part of a marketing strategy to prop up commercial fisheries. I described this sophisticated, well-funded strategy in Packard's Push Against B.C. Salmon, also published in The Financial Post. My letters to David Suzuki appeal to him to please make amends for the selective and false information that his foundation has widely distributed over the years about farmed salmon and salmon farming. Incidentally, shortly after I testified in 2006 to the B.C. government about Alaskan salmon marketing strategies involving environmental organizations, the American foundation that granted $560,000 for the "antifarming campaign" quietly re-wrote this grant and several others. Since 2003, this same foundation, the Gordon and Betty Moore Foundation, has granted $90 million to environmental organizations in B.C. David Suzuki has not answered any of the questions in my letters but in the spring of 2010, his foundation quietly removed 23 press releases and web-pages that I have found to contain selective or false information about salmon farming. According to my analysis of U.S. tax returns, the David Suzuki Foundation has received at least $10 million from American foundations, an average of about $1 million per year. David Suzuki could clearly report his foundation's U.S. funding, grant by grant, if he wishes. But more importantly, when David Suzuki invokes the name of science and appeals to the public to trust him as a scientist, it is important that what David Suzuki says is true. Great work exposing the bad science and lies by this ancient hippy. But now Suzuki has sunk to a new low scaring children at Christmas. Check the link to WattsUpWithThat blog to read about Suzuki's latest money grubbing scam.